Efficiently engineered for one off or volume production, the Sabre-Series 2 is constructed on a robust anodized aluminum baseboard. 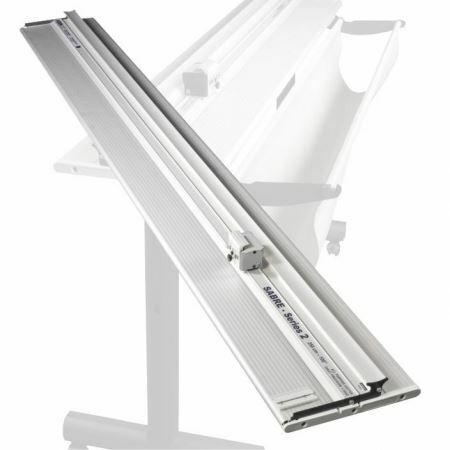 The Sabre-Series 2 is designed for use on a bench or attached to the optional stand. Using the lockable castors (included with optional stand) Sabre-Series 2 can be moved and positioned alongside any wide-format printer. Materials: Flag, banner, PVC Foamboard, foamcore, cardboard, corrugated plastic, polystyrene, flexible polycarbonate, flexographic plates, flooring tiles, magnetic sheet, film, self-adhesive materials and more. The stand, also available with optional waste catcher and roll feed, makes the Sabre-Series 2 a versatile cutter with no equal. A recess integral to the base protects the blade tip when cutting and a cutting mat can be added for cutting textiles. Full length silicon rubber grip strips in the Sabre-Series 2 base and underside of the cutter bar clamp materials when cutting and provide protection to even the most sensitive surfaces. Comes as standard with 3 blade cartridges suitable for cutting a wide range of flexible & rigid materials. The self-adjusting hinges give lay-flat cutting on all materials up to 13mm (0.5”) in thickness. The blades cut to a depth of 13mm (0.5”) and the patented linear bearings have been tested under load for 1600km (1000 miles) and carry a 20 year guarantee.